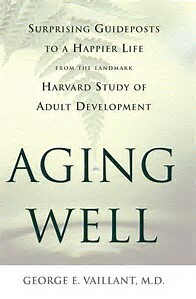 Aging well is a developmental task I hope to accomplish. I became aware of the book when a student, Kathryn R. Ward, decided to read it for a course I was teaching. I suggested some edits and her review was subsequently published in the Journal of Psychology and Christianity. I met George Vaillant at a Positive Psychology conference hosted by the Gallup Corporation. It was clear that he and his research team have learned a lot about aging as they have followed the progress of adults in the famous Harvard Study of Adult Development. What captured by interest was the emphasis on what works--what helps people grow and develop well. The book provides an in-depth summary of adult development from the perspective of Erickson’s developmental tasks. Using examples and empirical data, we learn of contributing factors to well-being such as play, wisdom, and religion. Those interested in research will find measures, tables, and figures in the appendices. As we observed in the published review, clinicians may find the summaries useful as they consider what tasks and concepts may be applicable to their own adult clients. For example, although we learn about development in the course of becoming mental health providers, we may need reminders to consider how a client's concerns may be related to the process of development. The Harvard study team provides updates as new information and analyses become available. To see a talk by George Vaillant on the importance of relationships to health, resilience and ageing, go to this YouTube site.